The Smart Energy LibGuide serves as an information sharing platform on the topic of energy efficiency in the military. 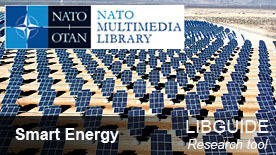 The Smart Energy LibGuide was created in 2011 and is maintained by the Emerging Security Challenges Division at NATO Headquarters in Brussels, Belgium. Your contribution with relevant and public material is highly appreciated. Contact us here. ♦ 3000 US soldiers were killed or wounded from 2003 to 2007 in attacks on fuel/water convoys in Afghanistan/Iraq. ♦ On average, there is one casualty for every 24 fuel resupply convoys to Afghanistan/Iraq. ♦ Transporting fuel to hazardous areas may cost 600 USD or more per gallon. ♦ Only one third of the fuel burnt by a conventional diesel generator is converted into electricity. Two thirds are wasted as heat. ♦ In Mali, the road for transporting supplies is called "the road to hell" due to attacks and accidents. ♦ Today, a soldier carries an average of 7 different batteries weighing about 20% of his/her total weight to carry. Find out more by exploring the tabs on the left. Since the Chicago Summit in 2012, Allied Heads of State and Government agreed that NATO should work “towards significantly improving the energy efficiency of our military forces.” They declared at the Warsaw Summit in 2016 (paragraph 135): "We will further improve the energy efficiency of our military forces through establishing common standards, reducing dependence on fossil fuels, and demonstrating energy-efficient solutions for the military." To this end, NATO’s Emerging Security Challenges Division (ESCD) has facilitated briefings, conferences and exhibitions with the aim to exchange information and lessons learned and to advance knowledge on technologies and best practices. A list of selected events is available under "Calendar". A special SPS funded activity was the “Smart Energy Team” (SENT), comprised of eight experts from Allied and partner countries. During the period January 2013 until May 2015, the experts screened national and NATO documents and visited defence agencies to identify practical energy efficient solutions and to provide recommendations for NATO’s standards and best practices. The final comprehensive SENT report that was presented to Allies in September 2015 is available under "Reports". Reducing fuel consumption in the military is an operational imperative. Smart Energy solutions cannot only save money when less fuel is used, but can also save soldiers' lives, and help improve the mobility, as well as the resilience and endurance of military forces. Following CL15 and the SE PX WS, NATO is in the process of mainstreaming energy efficiency in NATO policy documents and standardisation agreement (STANAGs). Furthermore, the NATO Smart Defence project concept "Smart Energy Training and Assessment Camp (SETAC)" has started in April 2017, serving as an umbrella for ongoing activities related to energy efficiency in military camps. Some of the NATO activities related to Smart Energy have been supported by NATO’s Science for Peace and Security (SPS) Programme, such as the series of IESMA events (see tab “Calendar”). This Smart Energy LibGuide was created in 2011 and is maintained by ESCD. It serves as an information-sharing and awareness raising platform. Your contribution to this LibGuide with relevant, public material is highly appreciated. You can contact us here.